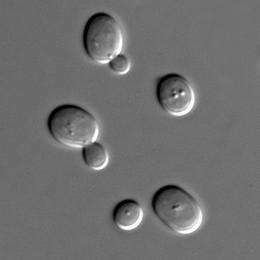 Sacharomyces cerevisiae cells in DIC microscopy. Credit: Wikipedia. The enzyme - RNA polymerase III (Pol III) - is present in most cells across all animal species, including humans. While it is known to be essential for making proteins and for cell growth, its involvement in ageing was unexplored until now. The study, published today in Nature by researchers from UCL, the University of Kent and University of Groningen, found that the survival of yeast cells, and the lifespans of flies and worms were extended by an average of 10% following a modest reduction in Pol III activity in adulthood. "We've uncovered a fundamental role for Pol III in adult flies and worms: its activity negatively impacts stem cell function, gut health and the animal's survival. When we inhibit its activity, we can improve all these. As Pol III has the same structure and function across species, we think its role in mammals, and humans, warrants investigation as it may lead to important therapies," said first author, Danny Filer (UCL Institute of Healthy Ageing). The effects of inhibiting Pol III were found to be comparable to the action of the immune-suppressing drug rapamycin, which has previously been shown to extend the lifespans of mice and many other animals. This discovery will help scientists understand the mechanism of action of drugs, such as rapamycin, that show promise for extending the lifespans of mammals. "Understandably, there's a lot of hype around drugs that extend lifespan and promote healthy ageing but very little is known about how they work, which is fundamental knowledge," explained study co-author Dr Nazif Alic (UCL Institute of Healthy Ageing). "We now think that Pol III promotes growth and accelerates ageing in response to a signal inhibited by rapamycin, and that inhibiting Pol III is sufficient to result in flies living longer as if they were given rapamycin. If we can investigate this mechanism further and across a wider range of species, we can develop targeted antiaging therapies." The team used a range of genetic methods, including insertional mutagenesis and RNA mediated interference, to inhibit Pol III in adults and observe the extension of lifespan. Yeast, flies and worms were used as model organisms as they are not closely related but all contain Pol III. Inhibiting Pol III in the guts of flies and worms, was sufficient to extend lifespan, and when Pol III was inhibited in flies' intestinal stem cells alone, they also lived longer. "It is amazing that we can make one genetic adjustment and positively impact on lifespan and intestinal health, understanding more about the underlying molecules at work here promises new strategies for anti-ageing therapies," said Dr Jennifer Tullet, University of Kent. The team now plan on continuing their work on Pol III to understand its function in an adult organism, and hence shed light on how a reduction in its activity can extend lifespan.